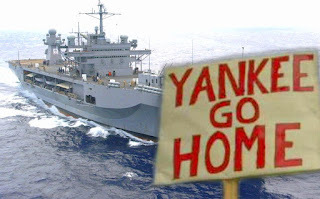 The presense of the United States 6th Fleet command and control ship USS Mount Whitney (LCC 20) and USS Mason, a US navy destroyer, in the port of Piraeus on October 24th has been strongly denounced by the KKE Piraeus Sectoral Organisation. In its announcement, the KKE calls the city's people to strengthen their struggle against the involvement of Greece in NATO's war plans. "They have the audacity to dock at the port of Piraeus, while the presense of NATO in the Black Sea, the Baltic Sea, the Aegean and the Mediterranean is enhanced, using for the last two sea areas the pretext of controlling the refugee flows which are caused and amplified by the imperialist wars and the dire consequences against the people. At the same time, the US, NATO and the EU, in their antagonism with capitalist Russia, slaughter the people for the control and exploitation of natural resources, of oil, gas, water, energy pipelines and trnasportation "arteries", in order for the monopolies to gain more profits, thus capturing larger shares of the market. The struggle to prevent any involvement, any participation of our country in the imperialist plans must be strengthened now. The Greek government of SYRIZA-ANEL bears huge responsibilities, continuing the same policy with the previous governments, in ordered service by the bourgeois class of our country, giving "soil and water", participating actively in the imperialist plans showing each time its willingness to involve the country even more. At the same time, the growing imperialist antagonisms and plans, the escalating intervention in the broader region of Eastern Mediterranean and Eastern Europe, objectively open issues of border change and sovereignty disputes in a wider region, bleeding the people again and again. We call the working class, the working people to strengthen the struggle against the involvement of Greece in NATO's war plans, for the disengagement (exit) of our country from NATO's "nest" and every imperialist alliance, for the removal of foreign military bases and nuclear (weapons), the return of the military forces from the imperialist missions, in order to put in practice the slogan "Neither soil, not water to the murderers of the people". This struggle must be included to the struggle for the overthrow of the rotten exploitative system which generates crisis, wars, refugees".